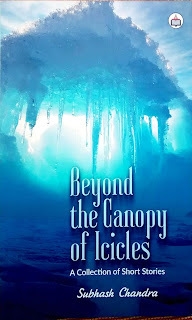 There is something about the cover of Beyond the Canopy of Icicles that makes the desire to look inside, simply irresistible! The cover of the book is indeed an impressive portal. The moment I stepped over the threshold, to my delight, I found myself totally engrossed in a compelling collection of stories. The first one I encountered, titled ‘Atheist’ sensitively touches on the question as to whether God actually exists. An intriguing wisdom is cleverly intertwined with the story of a family torn apart by differing beliefs. The question as to whether ‘faith’ wins the battle over ‘doubt’ is subtly answered. And being a deft craftsman, Subhash Chandra uses suggestiveness rather than explicit statement. Towards the end of the story, the protagonist, Abhay, who is overwhelmed by despair and hopelessness because of his son’s and wife’s death and whose life has turned into a vast, unending desert, starts walking towards the sound of temple-bells and the aarti (prayer) which signify assertion of ‘belief.’ Personally, the ending is in sync with my own theism. “Atheist” is a very thought provoking story indeed and that was just the start, with more truths concerning human struggles to follow; each story is written with honesty and compassion by this author who clearly displays an acute knowledge and understanding of the human race and all its complexities. The narratives have a definite modernity about them and are cleverly interlaced with visions of Indian culture. Therefore, the stories certainly have educational value; they also raise awareness of the differences in Indian culture compared to the British way of life. “Man/Superman,” is about a father with a weak disposition who is unable to protect his wife and daughter from repeated harassment by louts and becomes an object of scorn and contempt. But suddenly the story enters the realm of the ‘fantastic,’ as the spirit of his brave dead father enters him, and he is transformed into a superman. Alongside, the sub-text of the narrative points to the complicated nature of human relationships. If there is any truth in the impression given that ‘India is full of devouring males,’ then the gap in cultural differences between countries may not be so wide! The inclusion of Indian words and phrases in the text added to the interest for me, a British citizen; on several occasions I did need to consult the internet in search of translations! The adage ‘there is a moral to this story’ comes to life throughout, but the reader cannot detect a single trace of any attempt by the author, to send out judgmental messages. Two of the memorable phrases that remain with me are as follows: in the story “Mother and Daughter,” for example, the narrative arouses compassionate feelings towards a person with dwarfism, ‘He bends his head; was he trying to hide his ‘liquid grief?’ This story is a very moving take on the struggles of being diagnosed with this condition, especially because the options available to these people are extremely limited. But, as is often the case, when faced with adversity, those affected often rise above their disabilities and succeed in life, much to the admiration of the able-bodied. The English actor Warwick Davis, familiar to most, came to mind because he found fame in the Star Wars films and many other productions. The collection contains another story on disability. “A Pinch of Love” brings to light a human weakness whereby some people find it difficult to accept, or cope with disability in others, especially in a member of their own family. The socio-economic setup is changing in the Indian urban spaces today. Traditional family structure has crumbled. Grown up and married children move out of the house to fulfil their personal professional ambitions. The elderly are left lonely and vulnerable. “Get the Bill” brilliantly captures this changed scenario in which rational thinking overrides emotions. Murder of a mother becomes an episode rather than being a situation involving feelings of loss and grief. Alongside, the aspect of corruption is also referred to. “The Inside Story” underlines the stress and anxiety of trying to become a published writer. It contains a wonderful phrase which applauds the skill of creative writing as the ability ‘To create something out of nothing.’ Encouraging words for the budding authors! For several reasons, this story would strike a chord with all the emerging writers and enlist their empathy with the writer-protagonist, Vikas. “The Writ of Destiny” portrays the bravery of one man, who at great cost to himself, attempts to defend the rights of women. His actions are to be applauded but unfortunately this scenario is very close to the truth, even in these so called enlightened days. “Prickly Rose” takes the reader on a journey alongside a very brave man who is disabled by ruthless, power hungry, cruel political climbers. Life-changing injuries are inflicted upon this man because of his extreme efforts to represent and stand up for the tortured and the disadvantaged. There are glimpses of the caste system and its consequences. The reader is humbled by an increased awareness that disability frequently leads to increased dedication, selflessness and sensitivity towards the pain of others. This book celebrates disability in a tactful and impressionable way and gives a voice to those who are silenced and downtrodden. Politics is, indeed, a dirty game. In “Monster” the moral of the story comes through in the form of a warning that taking medication that has not been prescribed by a trained doctor, can lead to disastrous ill-effects. The story around this wisdom incorporates one man’s disrespect for women. Over-spoiling a child often results in rearing a selfish individual; one who will never consider giving thought to, or attempting to return the favours bestowed upon him in childhood. “A Caring Son,” contains this harsh lesson many parents find difficult to learn. I am somewhat reluctant to admit that “Romance in the Hospital” brought a smile to my face. It would appear that if unorthodox therapies involving sexual gratification were to be adopted in hospitals, it may well lead to an increased number of fatalities! It has to be said, that Subhash Chandra is extremely adept at writing in English. He is not only an accomplished writer but his narratives have the effect of teaching the reader along the way. In “My Sister Allia,” I learned that ‘tongawallas’ are workers who provide a four legged taxi service for tourists. I understand that ‘goonda’ means a thug or bully, and a ‘jhuggi’ is a house usually made from mud and sheets of iron, but then I have gleaned so much more from this excellent publication. 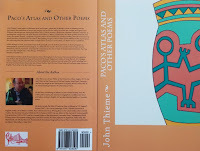 There is a great deal of wisdom to be found within the book along with intriguing aspects of human relationships, of romance, jealousy and a variety of angles which contribute to what we call ‘life!’ In “Dual Curse,” there are splashes of human greed, cruelty, medical situations, sexual and emotional traumas bound up in heart-wrenching situations. In fact, this book has everything that will appeal to, and trigger the interest of, people from many different walks of life. Each and every one of the stories could well have stemmed from fact rather than fiction. I firmly believe that this author has, at his fingertips, a future novel that would be greatly esteemed in the world of literature. 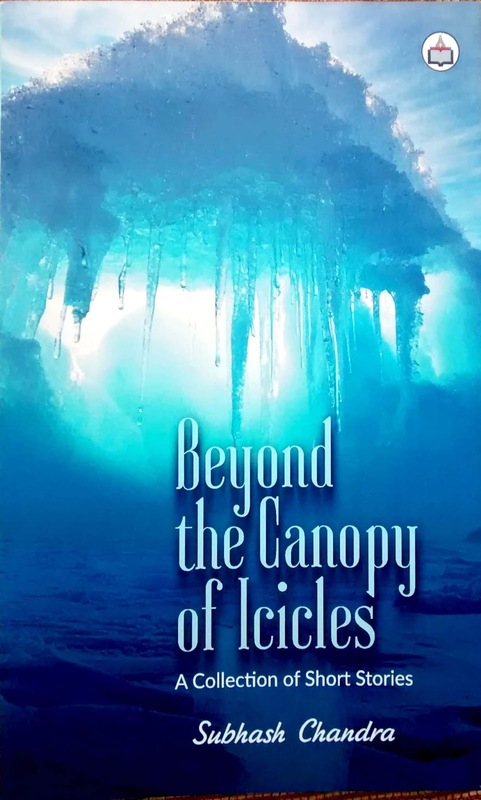 Beyond the Canopy of Icicles is a showcase for the depth of wisdom of this author; a man who is totally in touch with today’s world and those who inhabit it. Upon leaving the portal of this excellent book, the reader is more able to digest and appreciate further, the profound messages that leap out between the lines. An excellent book! A wonderful Review write, Betty Oldmeadow. You've certainly set the stage for a book read of "Beyond the Canopy of Icicles" by Subhash Chandra. Thank you, Leonard Dabydeen. This book was very inspirational and I wrote from the heart. 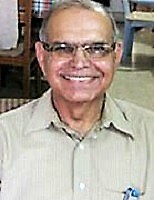 Subhash deserves much praise for his literary talent. I can see him achieving much in the future. Wonderful Review write, Betty Oldmeadow. Certainly set the stage for an interesting read of “Beyond the Canopy of Icicles” by Subhash Chandra.